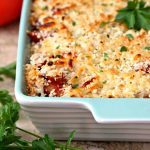 Dump and Bake Chicken Parmesan – An easy, cheesy dinner where everything bakes together in one dish. Just dump and bake and your dinner is ready! Dump uncooked noodles, pasta sauce, water, chicken and 1/2 cup mozzarella in baking dish. Add salt and pepper. Mix ingredients together. Make sure liquid covers pasta and chicken.